With marriage equality and Quay desserts hot on TV this evening it seems to be a fitting time to showcase The Equality Dinner that I attended at Quay Restaurant as part of the Sydney LGBT Mardi Gras festival. Gender and sexual equity is a huge part of my ethical landscape and as a member of my company's LGBT support group I was lucky enough to attend this Black Tie event complete with divine dishes and inspiring speakers. As well as an important event to discuss Marriage Equality in Australia it happened to be at the Iconic Quay Restaurant. For those not acquainted Quay is one of the most prestigious and well celebrated restaurants in Sydney. Currently home to Sydney's Chef of the Year Peter Gilmore, holder of 3 SMH Hats and recently celebrated in San Pellegrino's list of the 50 Best Restaurants in the world. Imagine my delight at a dinner at this notoriously difficult to book venue! While we hear wonderful speeches by the likes of equality advocates Mia Freedman and Dr Kerryn Phelps we were served a series of dishes far elevated from the usual "chicken or beef" so lets take some time to review the deliciousness. 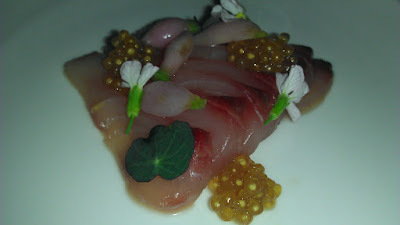 Sashimi of Hiramasa Kingfish, horseradish cream, smoked eel tapioca, horseradish cream, cherry bell radishes, nasturtiums. Loin of Riverina Lamb with artichoke emulsion, fennel, leek, confit tomato and Arbequina olives. Roasted Mulloway, stone ground semolina, heirloom carrots, buckwheat, farro and brown butter. For extra fun a number of charity auctions and raffles were held throughout the evening and as a ticket buyer I walked off with a number of beautiful Becker Minty luxury goods for my trouble.